The art supplier Cass Art has proudly supported Sky Arts’ search for portraiture talent, which debuted on television screens earlier this month. The show comprises of four Sky Arts festivals held in different cities, where one artist goes forward to the semi-final. 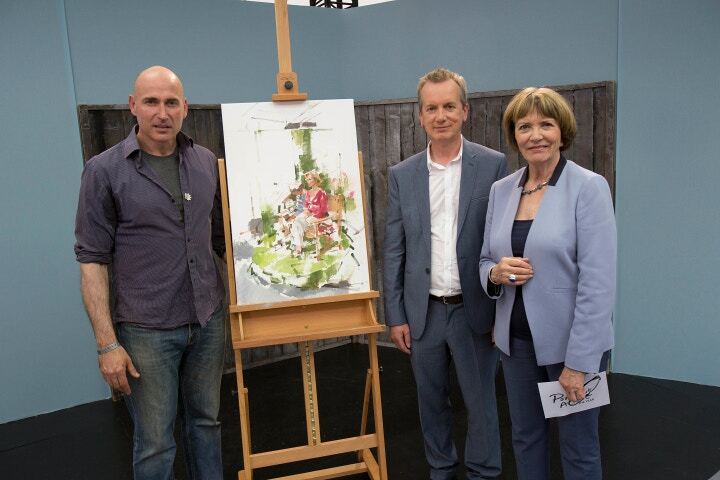 The contestants will compete in Paris and paint celebrity sitter Sophie Dahl under the watchful eye of the judges: Kathleen Soriano, Director of Exhibitions at the Royal Academy, Kate Bryan, Head of Contemporary at the Fine Art Society and portrait artist Tai-Shan Schierenberg. Luis Morris was announced the winner of the London heat on 5th November 2013. With a degree in Architecture and a background in bank note design, he stunned television audiences and the judges with his approach to portraiture. We spoke to him about his methods, materials and his experience of the show so far. How does it feel to be the winner of the heat in London’s Trafalgar Square? There’s still a bit of me thinking “did that really happen?”! Looking at the other artists’ self-portraits on the morning of the heat left me in no doubt as to the high quality of the competition. I know the final decision was a close call, so feel extremely lucky it went my way that day. Ultimately I paint for myself and try not to worry about what others may think, but to be chosen as the winner by judges of that calibre is a tremendous compliment. What have you been up to since the heat? The very next day I went back to work. I couldn’t talk to my colleagues about what had gone on. When asked what I’d been up to over the weekend I just said “a bit of painting”. Pretty soon I was re-immersed in the day job, which only heightened the sense of unreality of that day in Trafalgar Square. We watched in awe as you dealt in an unrecognisable series of blocks and colours before actress Juliet Stevenson and her son emerged from the page. Tell us a little bit about your style and how you came to paint in this way? In my early years I worked in a, very tonal, representational style which was ideally suited for my job as an illustrator of portraits for banknotes. However, when I left my job and went to art school, teachers showed me a different approach to painting that encouraged me to look at things in a more abstract way and to be more sensitive to the unique combinations of colours and shapes that each new subject presents. They also taught me to be selective and leave out unnecessary detail. When painting I like to let the subject emerge naturally, almost as a by-product of looking, thinking and feeling. I start by finding some essential colour and spatial relationships on the canvas, so for quite a while it can stay pretty abstract. When painting Juliet and Gabriel, I was aware that by half time most of the artists had got a likeness, while I seemed to have barely started. It’s then a case of not panicking and of trusting that it will come together. What is your favourite medium? What’s your favourite art material? My favourite medium is oil paint. To me it is the most versatile medium of all and the best vehicle for expressive painting. I love the smell and the texture of it, and I think it is important for a painter to have an appreciation of, and to enjoy, the physical qualities of the medium they are using. My favourite art material would have to be my palette knife and my palette. I consider these implements to be the driving force as they help me to find colour relationships which are central to the way I paint. What are you looking forward to about the next round? I’m intrigued to meet the other three regional winners. I’m also looking forward to talking with the judges, to hearing their opinions on how I paint, and to hear their ideas as to how I might take my portraiture on from here. It feels like a new beginning for me. Photos © Tim Anderson/Sky Arts.